"SOME of the old movies have great composition, it's like a drug that I am drawn into when I see some of the images," revealed local photographer Gabor Fur when asked about his introduction to the art of photography. "It had become a hobby that is a necessity now." Fur, who happens to be an acquaintance of mine, was born in 1981 in Dunaujvaros, Hungary, a town with a population of less than 50,000. He moved to Canada with his parents in 1989 and now calls Edmonton home. His interest in American cinema, most notably Stanley Kubrick's A Clockwork Orange and 2001: A Space Odyssey, soon transitioned into a passion for still photography. 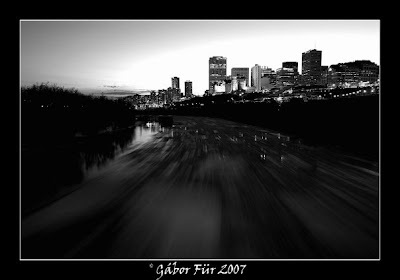 Most of Fur's photos are black & white, including the one below, 'Frozen River,' which captures the floating ice chunks of the North Saskatchewan River, just short of Edmonton's downtown. Fur uses a Canon 30D/EF DSLR. This picture belongs on postcards!